Salted caramel berry chia pudding | Delicious and easy breakfast recipe. 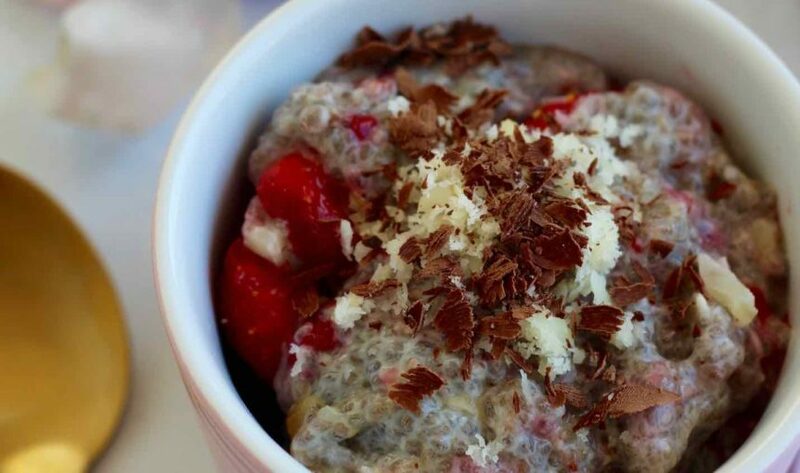 Chia puddings are not our go-to breakfast preference but far out when we make them we remember how delicious they are! This salted caramel berry chia pudding is all kinds of yum! Plus the best thing about chia puddings is that you can easily prepare them the night before and BOOM wake up and brekky is ready! This recipe is a little sneak peek from one of the meal plan bundles on the Get Merry app. These are extra recipes you can unlock once you pay the one-off price of $7.99 (AUD). BUT once you download with the one-off payment you instantly get access to our BEST recipes from the blog plus extra app only special recipes. There are about 80 or so app only recipes on the app, here’s a list of 50 app only recipes right HERE! But we continue to add app only recipes every month! YOU CAN DOWNLOAD THE APP HERE! In the meantime, whip up this delicious and healthy salted caramel berry chia pudding. In a bowl or large jar mix all the ingredients. Place into the fridge for at least 2 hours. We like to make ours the night before and leave overnight, you might need to add a little extra liquid in the morning. Top with extra macadamias and grated sugar free choccy (if you like!). Not keen on the medjool dates due to fructose levels? Swap to 2 tsp. rice malt syrup and 2 tsp. tahini.